I proposed to Nora today, and she said yes! I look forward to many, many happy days ahead. 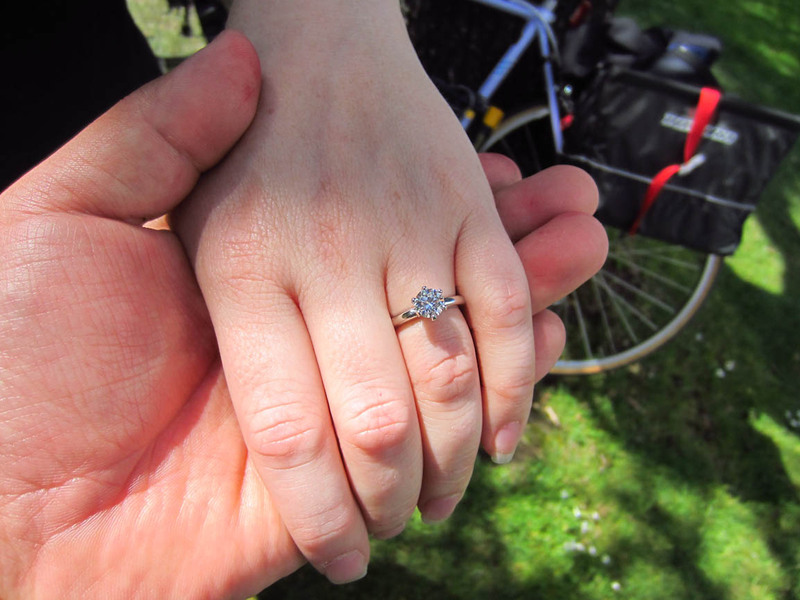 But today’s post is not about my engagement, but rather about how I chose an engagement ring. This is a deeply personal choice that people need to make for themselves, and I offer my story only in the hope that it will help out some nameless stranger in the future. I chose to propose with an engagement ring because I’m sentimental and I thought a ring with a diamond on it was a nice symbol of our commitment to each other. Most importantly, I had intuited that Nora was also ok with it. If she wasn’t, that would be no big deal, and no ring would be offered. Tradition or otherwise, it’s important that your mate is cool with your decision. What I also firmly believe is that there are many ways to express your commitment to your partner, and a ring is just one way, no more or less valid than any other. Having said that, i was also aware that mined diamonds can be of dubious and bloody origin, and in all cases the cost of production is far lower than the cost to consumers. Bain (consulting, not private equity) created a great report about the global diamond industry which said that a 1 carat diamond that sells for thousands costs no more than $60 to produce. DeBeers, who controls 40% of the world’s diamond production, created the very idea of the diamond engagement ring and coined the phrase “A Diamond is Forever” and the three months salary guideline. The world’s most popular setting is the Tiffany Setting, created in 1886 with virtually no change over more than a century. To give you an idea of how much marketing money is being spent on selling diamonds, simply do a Google search for “Diamond”. There is so much paid inclusion manipulating the results, that the Wikipedia entry for diamonds is near the bottom. To be honest, I’m not bothered at all by the use of marketing to drive up demand for a product- I would stand on a slippery slope if I refused to buy things that I wanted more because I was exposed to a marketing campaign. What I am bothered by is the lack of innovation in these industries. Good businesses reinvest their profits into growth and innovation, which is why I decided to buy a synthetic diamond. Synthetic diamonds are diamonds, but instead of mined by a worker, they are grown in a lab. Industrial synthetic diamonds have existed for many years, but the the process to create them results in colored diamonds, and only recently have colorless diamonds in gem quality become available. Where a mined diamond costs $60 to produce, a colorless lab grown diamond costs upwards of $2500. Despite this, the retail price of a lab grown diamond is still significantly less than a mined diamond of the same quality because of the close to 100x markup on a mined diamond. For now, there’s a pretty significant floor for breakeven pricing on synthetic diamonds, and the $100 carat is still a long way off. But I have no doubt that the synthetic diamond industry wants to radically reduce the cost of gems. The diamond industry is aware of this, and I expect that millions will be spent to cast synthetic diamonds as something more akin to Cubic Zirconia or Moissanite. They are neither of these things, but real diamonds created by scientists, technicians and engineers who are trying to disrupt an industry that is long overdue for disruption. Like an early Tesla adopter who knows that they are financing the development of better and cheaper future products, I’m happy to spend money on a synthetic diamond of known non-dubious origin. I bought my synthetic diamond from Gemesis, who sell directly to consumers, and I got a beautiful diamond for about 30% less than what Blue Nile would charge for the same grade. I was gullible and signed up for their mailing list, but instead of spam I got a 10% off coupon, and every little bit helps. The diamond arrived in a nondescript FedEx box with nothing that says “Gemesis” on it- in case you are worried about package interceptions. I told Nora the box was filled with RC car parts, and given the things I buy on eBay, there was nothing suspicious about this at all. I really do like the look of the Tiffany setting, but Tiffany won’t sell the setting without their diamond on it, so I found a local jeweler who could do an elegant six prong setting in platinum, and Nora and I couldn’t be happier with the outcome. The ring was pretty nice, too, and for $6500 total it was significantly cheaper than a name brand ring with a mined diamond. This entry was posted on Saturday, March 30th, 2013 at 5:23 pm	and is filed under consumerism. You can follow any comments to this entry through the RSS 2.0 feed. You can leave a comment, or trackback from your own site. No way!! Awesome news. Mazel tov, Nick and Nora!! !